cc licensed ( BY ) flickr photo shared by me I give myself credit to modify! I don’t really have to explain why I blog. Actually I am compelled to. I cannot stand to NOT blog. It’s easy, and as I said in my first post, April 19, 2003, on a them self hosted MovableType blog- I Blog Therefore I Am. It is for me, primarily, how I think through ideas, issues, and stuff that makes me want to puke. It is as much a part of my cognitive process. In last week’s pre class discussion for the Program for Online Teaching Certificate Class I kind of jumped on someone in the chat who said “I do not have time to blog”. I was probably kind of rude, but I refuse to buy that as an excuse. It’s a copout. Kids have a name for that– “stingy”. Here is how people operate, we make time to do things that are important to us. First of all, the thing I assure people spend a lot of time doing is email. Let’s review what to write email. Spend a little time thinking about what you will write. Open a piece of software (or web site). Write out your email, format it, maybe paste in some URLs and/or open a file on your computer, and add it as an attachment. You know what you just did? That is the same amount of effort it takes to blog. You what people spend a lot of time on email; doing? Forwarding links. Thats a stupid place to share. Or get this, scheduling meetings. C’mn you have seen this, or even done it yourself. It could take easily 25 emails to schedule a meeting between 4 people, when it could be done with 1 email and a tool like http://doodle.com. That is not blogging. That is composing a paper. That is thinking about a blog as a highly published final piece of literature. Blogging should be conversational. It should be half baked. Or less. It should (in my case) contain typos –because it is not meant to be (IMHO) a published journal article- it is your own personal thinking, shared out loud. If you are spending that long writing a blog post, then you are wasting time. And you are blogging wrongly. 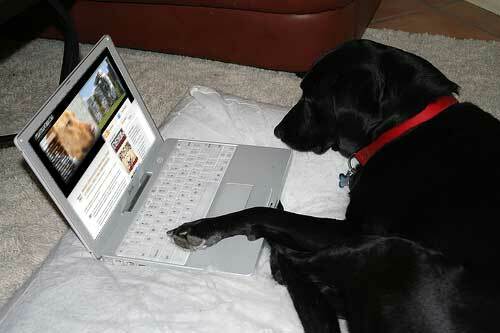 Let me tell you how I blog. I don’t use a computer. As I am driving, walking, hiking, biking, sitting drinking my coffee, I am often composiong the blog in my head. i get an idea of something I want to write about (like this), and by the time I sit down to the computer, its really a matter of dictating it (well sort of, I do a lot of rewriting as I type). But the idea, or the seed of it, is mostly done. I spend more time finding photos (actually I do not, I usually can locate, usually in much less than 10 minutes, the creative commons photo I want uaing compfight. In fact the photo above, I searched on “dog computer” as tags, and ironically one of the photos was my own. But thats a different story. Do you know what you were thinking about on a date, like, say September 30, 2005? See if you can recall. I don’t becaue I have an outdoor brain — http://cogdogblog.com/2005/09/30/ (wow that was a blog heavy day). It has been a long time since I nodded when reading (maybe it was listening to) the IT Conversations podcast where Jon Udell spoke about his notion of narrating the work we do (I was also listening because he was talking to a colleague Hilary Mason who is now a big shot in the tech world). We’ve been using this tool since November, internally at UserLand. We shipped Radio 8 with it. When we switched over our workgroup productivity soared. All of a sudden people could narrate their work. Watch Jake as he reports his progress on the next project he does. We’ve gotten very formal about how we use it. I can’t imagine an engineering project without this tool. Since then I’ve spoken a few times about the idea that by narrating our work, we can perhaps restore some of what was lost when factories and then offices made work opaque and not easily observable. Software developers are in the vanguard of this reintegration, because our work processes as well as our work processes are fully mediated by digital networks. But it can happen in other lines of work too, and I’m sure it will. But it really has not happened (that was written in 2009, so not that long ago). So for me, blogging is not about writing for other people (though with syndication and truly open networks, it is a benign and beneficial side product), it’s really for me. Not to be found or anything, but for mw to be working out ideas in a visible space– it just makes sense to me. Why would we not be all doing this? One of the very first things I heard when I started as a green ed tech rookie, at a Maricopa Community College Ocotillo Retreat in 1992, was “we really want to be able to know who is doing what in Maricopa”. This was not big brother reading your email, but in a large system– but actually any size organization, it is most common that people on one branch or side of it (say in a different camps, department, etc) does not know of innovation work being done elsewhere. How could one know? I spent years at Maricopa trying different approaches. I even built a system people loved, and we tried real honest approaches like bribery and competition. But if we pried free some of that time and effort we lavish on emails, and maybe did regular amounts of publishing in our own spaces, think if the potential for not only informing people in our organization, but our community, our world. When you send someone, or a group, some useful resource, or an idea via email, how many people gain from that? Is that information easily recoverable? Addressable? Email is the black hole of information, it is where ideas go to shrivel up and die. I never formulated this coherently, but in my time at University of Mary Washington, I saw a potential for them as an organization, because of their size and familiarity, to become a place that openly writes about all the work they do, not just classes and gung ho tech profs, in the open. Students too. Like everyone doing this. And has it netorked, aggregated, re-aggregated. It is the syndication network that people like Cathy Finn-Derecki and Jim Groom have put in place, and they are getting closer and closer. They have the platform and infrastructure of umw.edu, but frankly, a lot of the department and office pages have a feel of static pages. Or one line posts with links to PDFs. If you had a place where not only profs were thinking and writing in the open about the work they do, but also staff, admins -those department pages could become living, remixed flows of ideas. The technology is not the problem, it ia an inability to see, and appreciate the power of narrating the work we do. So here is why I blog. It is foolish and informationally selfish, not to. It is foolhardy in a networked environment, to not give back in some way to the content and information that flows towards you. And you are cheating yourself out of a gift of now only knowing what you did on a given date, but being able to track how your thinking and ideas have evolved over time. 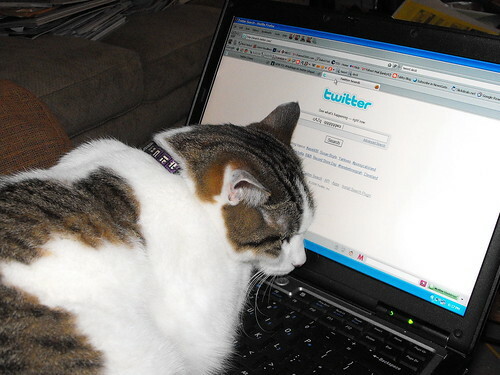 Heck, even cats can blog. If that does not convince you, I am lost. I don’t blog, because I can’t. I haven’t really been able to blog since 2008. I still blog in my head. I write these amazing posts about stuff I’ve done that might help other people. And then when I get close to actually typing it, I feel sick inside. The stuff that got me all excited, now makes me feel ashamed. Blogging doesn’t feel conversational to me. It feels like me telling other people that I know something. I don’t like the thought of people doing stuff because I did it. Maybe that’s why I prefer to tweet. I like to throw my little thoughts out there and see what other people make out of them. When I look back at my prior edublogging, it feels like I was just trying to be a cool kid. I want to just be me. And I want it to be okay for those of us who don’t want to blog. You see my way of blogging is by writing off the cuff and making mistakes. Ok so I do not mean to insist everyone blog (I think they should at least try). Everyone should reflect and share back to the open space. I wrote this really outbid a response to the. “I don’t have time to blog” and this projection that people need to be perfect and eloquent and be Really Really Smart. What I see is a field where we should he wide open to experimentation dominated by what comes off to be as a bunch of fraidy cats. “Oh I can’t write in public, someone might criticize me or tell me I am wrong” when did education become a field full I’d people afraid to take risks? Afraid to be wrong? You know (I hope) Jen I am not talking about you. I miss your writing. You use that wit and intelligence in twitter but twitter affords you know narrative, now recall, now sense of development because it is not a legacy you maintain. Your post hooked me from start to finish. I noticed as if was a conversation, but also I noticed you are an expert. It is not so easy. I am not saying I am not blogging nor I will not write a post, I do it. But I can understand Jen. I often have the feeling that my post was said before or that it is not important. For that reason I stopped to blog 2/3 times. I close the blog, and reopen, and close it again. I think that the most important is to say something you want to say, but it is not always easy for everybody. Anyway I am sure that if you write post, at the end, one find their way. I now I am driving my own way with all of you. Thanks for the alternative perspective. Oh yes, I forgot. Those reasons. What it feels like this is a lot of greek chorus among educators “SCHOOL IS BROKEM” and “TED Talks” and “Yeah, Sir Ken Robinson” curate this / curate that. I want to see more places where people try new ideas, take risks, fail and try again. And what I hear when people say “Blogging is not for me” or “I don’t have time” is the idea that they have to look perfect when they publish online. That is the false mirror world of Facebook. No, I don’t expect most people will blog. I would not order them too. People will do what they want to do. But I will prod them. I think part of the challenge in convincing people to blog, is that you have to first convince them to share the values you have that make you want to blog. I don’t value seeing my learning journey, especially not in public. I don’t value being able to go back to a certain date and know exactly what I was doing. I happen to like the frailties of the mind. I like that when I try to remember something, my mind serves it up in a way that may not be entirely accurate, but may help me apply it most aptly in my present situation. I prefer my mind to extract meaning from past events, than to be prompted by a single-sided interpretation of a moment, based on my mindset and motives at the time it was written. I enjoy living in the present, and I have no desire to leave a digital legacy. I think that’s why it’s easier for me to write things that are completely fictional. If you told the Dominoe story right now, without thinking about your digital story, how different would it be? Maybe try a different kind of 50 ways to tell a story. Pick a single experience, and tell it from 50 different perspectives. I don’t like my stories (which are usually based on shared-experiences and not ‘mine’) captured from a single perspective, which might influence my future memories of it. As always you make me think more deeply, Jen. I totally respect your own approach. My mind is way too frail to trust. I am visiting the area I left 25 years ago and it is so dim I have almost nothing. The past helps me frame the present, but as a trajectory to now, not a reiteration. ;-) I am in the present, but it makes sense for me to map my own evolution. Maybe the difference between snapshots and memories. Really enjoyed this post. My blog space has been gently tormenting me of late. Perhaps something to do with that blasted #ds106. I wonder what that space is for me, how I’m using it, what I want it to do. I appreciate you sharing the way your blog is your digital brain – a place to stash stuff for safe keeping. If others find it useful, fine, but this space is yours alone. Like one of those 5-subject ringed scribblers that I carted religiously through every year of my undergrad. I still have those in a box in my mom’s house – they will never be consulted, if I am to trust my own patterns. But the public aspect of it all, and that idea that we’re here (in the digital world) to somehow cash in on the riches on offer for those who can carve out their own niche. The traditional way of carving out a niche is not by sharing your faults, half-finished thoughts, embarrassingly narrow viewpoints, but by marketing yourself in the bright an shiny way. I also appreciate the connection back to education (which is just a small indication of how we could be in larger society). Sir Ken, Freire, critical pedagogues and those involved in the liberal arts project try in small ways to open those cracks in the glossy picture. They ask us to commit, dive in, admit that all you know is filtered through your perspective, and connect what you’re doing back to who you are. Blogging may not be for everyone, but the space is free for anyone to create their own world. I am put off by the tone of your post. Reading it does not make me want to blog more but less. Are you interested in persuading or pronouncing. It feels to me like the latter. I am deliberately aiming to provoke. Not to bully or pronounce but to raise dialogue. What good are we doing in a space of potential dialogue is only say nice things and pat each other on the back in three part harmony? Isn’t a public discussion of differences healthy? Tell me why I am wrong. I am here to demonstrate the value of stirring things up. So far I either have made people go blog out of guilt (that is wrong) or get defensive. It’s my belief, stated perhaps overly strong here, that public reflection on the work we do as educators is a good thing not only for us as individuals, but also us as a profession. This frequent reticence to do so out of fear of being caught being “wrong” or “imperfect” is, to me, detrimental and not the things we should model. I am here to make mistakes in public. If that is bothersome, so be it. So blog a response. Tell me how I am wrong. That is what I want to see. I guess it’s not so much what I was thinking in 2005, but what I was doing. Things come up, I get an idea, I think I’ll do that, oh wait didn’t I already do that? what happened when I did that? Ted and I both use blogs as memory rather than pronouncement, provocation or persuasion. And Jen is right that it rarely feels like conversation, unless you have lots of people participating on one post (like this). Even then it will scroll by quickly and become memory. Its effects will play out elsewhere. My blog is the same – its effects will play out elsewhere. I don’t need to see them. When I feel self-conscious, I change a few words or a phrase. And I try hard to keep in mind it’s my blog, like my house. People can stop by, but they don’t live there like I do. I do a little blogging of my own. Like you, it helps me think stuff through. If other folks want to read it, that’s great, but it’s mostly a thinking space for me. However, I have a colleague who is a consummate professional and has tried blogging lots of times. Because we both work in techie professional development roles, she feels a lot of peer pressure to blog. But that’s not how she thinks stuff through. She needs to talk with others to really process well. This, I think, is why blogging hasn’t connected for her. She loves to share, is leaving a digital legacy through her work, and is a true inspiration to many. She just doesn’t learn or process by writing. I worry that your passion for the benefits of blogging (which I don’t deny) is – as you tagged it – mostly a rant written from a bit of a narrow point of view. To your credit, I’ve enjoyed reading your comments below your post as this dialog continues. and 2. I would check for the typos and to make sure that I am making sense because I want anyone who pops by my blog to want to come back because they can read/understand what I am trying to say. Thanks for sharing this! I tend to be a reader and not a poster…. so hearing your point that this is the lazy way out is what I needed to hear to get me to post.